Fulbright Thailand, in cooperation with the Thailand Research Fund (TRF), is delighted to offer Fulbright Junior Research Scholarship Program (JRS) for the year 2019. Applicants from Thailand are eligible to apply for this scholarship to study in the USA. 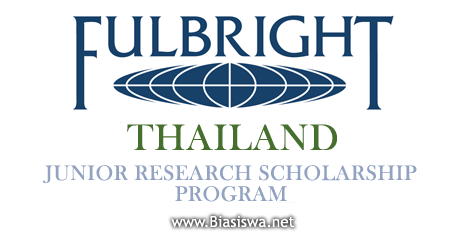 "Fulbright - Thailand Research Fund Junior Research Scholarship Program," aims to develop capabilities of Thai university staff members and interested persons to gain six months of research experience in the United States as part of their doctoral dissertation requirements. The Fulbright Program in Thailand was established on July 1, 1950 by the creation of the United States Educational Foundation through a bilateral agreement between the governments of Thailand and the U.S. The Foundation was renamed the Thailand-U.S. Educational Foundation (TUSEF) in 1963 but is popularly referred to as "Fulbright" or "Fulbright Thailand". Level of Study: This is a six months long research scholarship programme. Available Subject: Scholarship is awarded to learn any of the courses offered. Scholarship benefits: For the grant sponsored by Fulbright Thailand, benefits are intended to cover round-trip international airfare, the monthly stipend for six months, in-transit allowance and health insurance. For the Fulbright-TRF partnership, funding support will be mainly provided by the Thailand Research Fund (TRF) with additional fund from Fulbright Thailand for not exceeding a period of six months. Eligible Nationalities: Applicants from Thailand are eligible to apply for this scholarship. 2. All attachment files must be in the format of PDF only. 3. For transcripts and TOEFL iBT, TOEFL ITP or CU-TEP score, a scanned copy must be of the original documents. However, please include only photocopied documents of those in your hard-copy application packet. Please do not mail us the original documents. It is highly recommended the recommenders are those qualified to evaluate the applicant's qualification. Applicants must include two letters of recommendation in sealed envelopes (sealed by the recommenders) in the application packet or the recommenders themselves email their letters (a scanned copy) directly to tusef@fulbrightthai.org with the subject: Recommendation letter for JRS Application. The two recommenders need not choose the same method of submitting their letters. In other words, one may opt to submit by e-mailing to tusef@fulbrightthai.org while the other in a sealed envelope. 5. Applicants must submit both online application and a set of hard-copy application. 6. Applicants will be notified, provided they are selected. The results can also be viewed on our official website at www.fulbrightthai.org approximately two weeks after the application is closed.